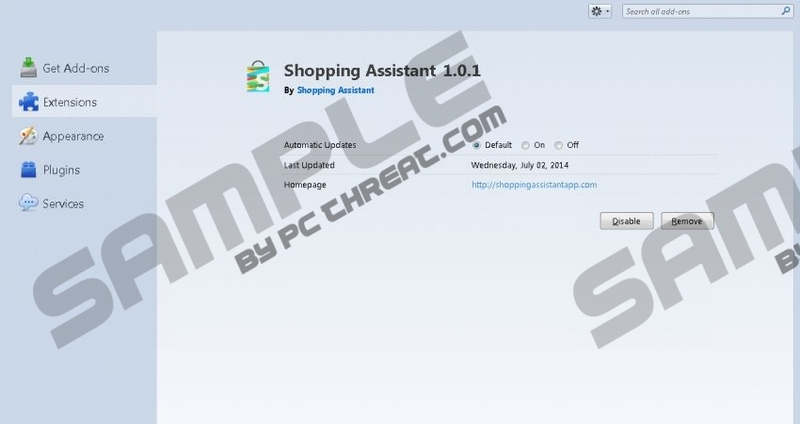 Shopping Assistant is an adware application. As the name signifies it is targeted to frequent online shoppers. If you are one of them, you should not be fooled by their marketing slogans, which state that you will be able to save money while shopping online if you install Shopping Assistant. If by accident your operating system is already running this adware you should remove it right away. It will in no way help you while shopping online; in fact, you will be disrupted and annoyed to no end. Applications like Shopping Assistant should be avoided at all cost. At the very moment that Shopping Assistant infiltrates your operating system it installs extensions to Mozilla Firefox and Internet Explorer. It was noticed that Google Chrome is not affected by this particular adware application. But it does not mean you are safe if you use Google Chrome. Creators of this application could update their application, so all the popular browsers are affected by it. After the extensions are added, your browser will be flooded by numerous commercial adverts and pop-ups. Often pop-ups can promote some fake software. These applications could contain malware within. It is possible because vendors of Shopping Assistant work closely with various third parties. In fact, they do not bother to review the activities of their associates. Thus, it is probable that malware distributors are involved. Therefore, it is probable that software promoted by Shopping Assistant is a product of cybercriminals. In order to avoid malicious activities, you ought to remove Shopping Assistant immediately. In most cases, adware applications are distributed via bundled software. Shopping Assistant is certainly distributed in this way because the direct download link within the official website does not work. Most installers that are filled with questionable software come from third-party hosting websites. It means that users who get infected by applications like Shopping Assistant tend to ignore the guidelines of safe browsing. In order to reduce the risk of getting infected in this way, you should download all your software only from official websites. Furthermore, installing a reliable antimalware tool is firmly advised as it can detect and remove suspicious installers way before you would. Removal process of Shopping Assistant is relatively simple. If you follow the removal guide closely, you should be able to remove Shopping Assistant without any serious trouble. Often the removal only via Control Panel might not do the trick. This is why we include the entire list of files, folders and registry entries that should be removed from your system in order to remove Shopping Assistant completely. If you have doubts about performing all of this manually, you should implement licensed antimalware tool and let the application do the job. Type Control Panel into the search box and then click on its icon. Locate and uninstall Shopping Assistant. Select and remove Shopping Assistant. Remove Shopping Assistant from your PC. Quick & tested solution for Shopping Assistant removal.